So the take away from this is to feed the Catkins diet, high protein and low carbs in small meals split throughout the day. This is Doctor Dave Dolan from Creekside Animal Hospital in the Woodlands, Tomball area doing another video on how we can better care for our pets. Today we're going to talk about fat cats and the problems associated with obesity in cats. We talked about obesity in dogs a couple days ago and today's discussion is similar, but there are some distinct differences. What is the Best Way to Feed Cats You Might Ask? First of all, cats are carnivores. That means they eat meat. Dogs are omnivores so they can eat meat and everything else. So they can eat dry kibble without a problem. As carnivores, cats should not eat plant material, which is necessary to produce dry kibble, so cats should ideally eat canned food. Canned food comes in various sized cans, but the 5.5 ounce can is just the right size for cats. If you think about it, cats don't have a big stash somewhere like a pig or a cow where they can go back to eat as they like, they have to catch their food on the fly, so to speak. They eat a mouse here, or a bird there, even a lizard or a snake. Speaking of which, how many times have you seen a cat go deep sea fishing for tuna? Not very often I would imagine. So don't go crazy with the fish-based diets, they may not be metabolized the best way for cats. They may be too fatty for them. Instead, feed a protein-based diet without too many carbohydrates. One diet that seems to be really good is JAM diet which is a diet that we sell here at Creekside. It is so good that it's actually fixed the metabolism in some diabetic cats so that they recovered from diabetes and did not need insulin. In the wild cats eat small meals multiple times a day. One can a day divided two to three times is perfect for feeding your cat. If all you feed is canned food, it's kind of hard to cheat in terms of overfeeding since you would have to open another can to do that. Why Is Obesity in Cats a Problem? Well, I mentioned diabetes already and that's a real problem, especially in cats, but another big problem is fatty lipidosis, fatty liver disease seen in fat cats who stop eating. 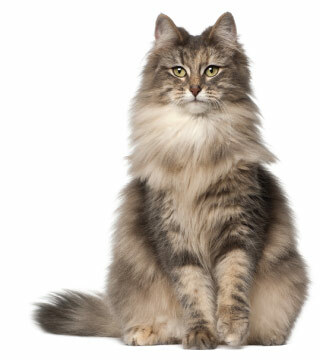 Cats have this metabolic process that is life-saving in wild animals who need to catch their food to survive. If they do not eat, the body sends fat stores to the liver to be metabolized into energy so they can still catch their prey. Otherwise, they would get weaker and weaker and slower for lack of energy from not eating which means they wouldn’t be fast enough to catch their food. Fat cats who have more fat storage tend to inundate the liver with fat when they stop eating and can actually die from hepatic lipidosis all because they don't like their food. So the take away from this is to feed the Catkins diet, high protein and low carbs in small meals split throughout the day. At Creekside Animal Hospital, our compassionate and supportive veterinary team is here to help you in any way that is in the best interests of you and of your feline companion. We understand this is a very difficult time regardless of the situation. You have lived with your cat for a long time, you have a strong bond with your cat and the grief process is real and should be taken seriously. Please contact us for information about end of life services including grief support.